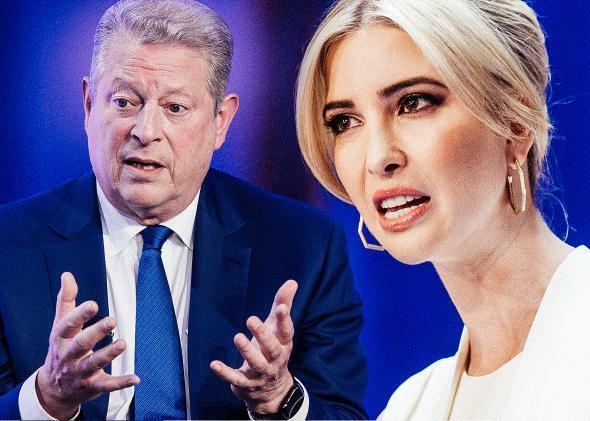 Ivanka Trump, Al Gore meet re: climate change. Photo illustration by Slate. Photos by Nicholas Kamm/AFP/Getty Images, Christopher Gregory/Getty Images. Update, 1:15 p.m.: Apparently Gore also met with Trump himself. Since his meeting with Ivanka was explicitly about climate change, that’s presumably one of the subjects he discussed with Trump, though Gore didn’t specifically say that. Original post, 11:51 a.m.: Donald Trump and his lieutenants are continuing to hold meetings in New York with potential Cabinet members and administration advisers, with figures such as John Bolton, Rob Portman, and Al Gore seen at Trump T—wait, what? Al Gore? It’s not quite totally surprising that Ivanka Trump would meet with a climate change activist; her role in her father’s campaign was to seem kind of reasonable about a few pet issues without actually influencing anything he said or did in a useful or humane way. (She apparently met recently with Leonardo DiCaprio to discuss global warming as well.) But on the other hand, it is totally surprising, because Donald Trump has written that “the concept of global warming was created by and for the Chinese in order to make U.S. manufacturing non-competitive” and has called the evidence of climate change a “hoax” on at least four occasions. *No one calls him this.